It’s hard to say pupusa with a straight face. It’s like saying pupu platter without giggling a little. But funny words notwithstanding, this tasty soft tortilla stuffed with cheese and pork and served with pickled cabbage and tomato sauce is an explosion of flavor. It’s got great texture. It melts in your mouth. And it’s a lot of work to make. But the experience justifies the labor that goes into preparing this typical Salvadoran dish. 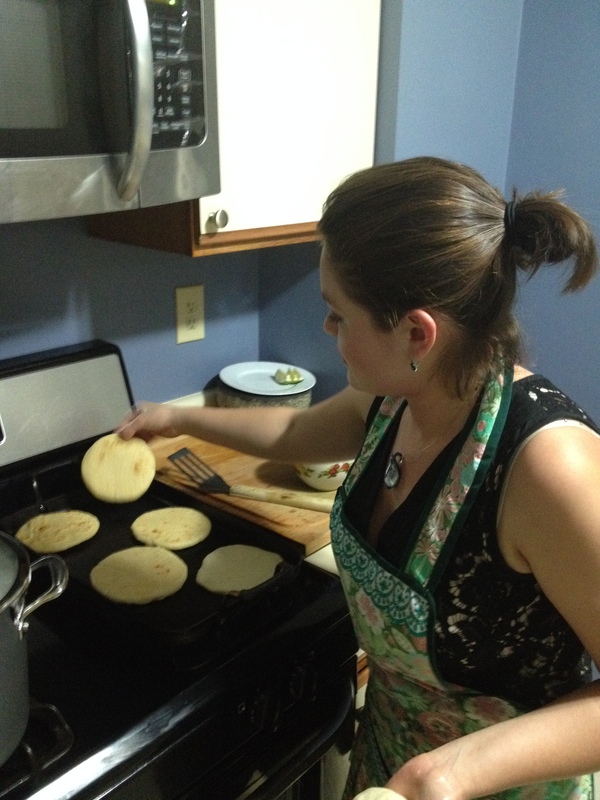 Ever since I ate my first pupusa in Somerville almost 20 years ago, I’ve wanted to learn how to make the real thing from a Salvadoran cook. My opportunity came just a few months ago, when my coworker José told me that his Salvadoran wife Janneth makes the best pupusas. So I asked him to have me over for dinner. I arrived at José and Janneth’s house on a Sunday afternoon ready to ask a bunch of questions, but the moment I set foot in that kitchen and saw a yellow apron folded neatly on the counter, I knew I was in trouble. Things went downhill from there. Making pupusas is hard work. Thank goodness Janneth had already made the chicharrón filling ahead of time. She had also made the curtido (pickled cabbage) and tomato sauce – the indispensable accompaniments you must commit to making. 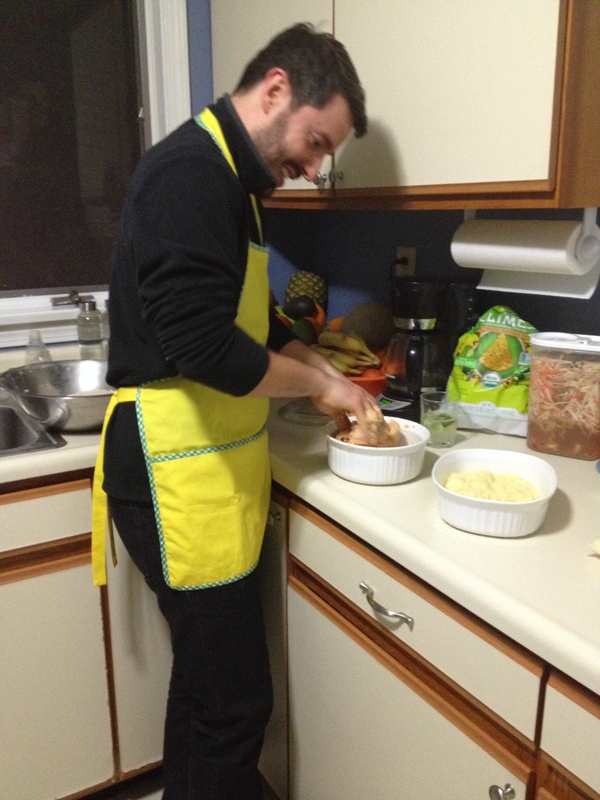 Even then, we spent a couple of hours just mixing the dough, forming the pupusas, and cooking them. Through that process, José entertained us with great panache – making caipirinhas and dancing to blasting merengue in the kitchen while we smoked up the house. Needless to say, we got a little drunk. Janneth grew up with an aunt in Allston who taught her to cook. José also grew up in Allston, having come from El Salvador as a young boy in the wake of the country’s ravaging civil war that lasted into the early 90s. They met in the neighborhood, moved in together after dating for a little while, had baby boy named Nelson, and got married in 2010. I’m not sure I got the order of events right. When we finally finished cooking the pupusas and sat down for dinner, my head spinning from the combination of José’s caipirinhas and Janneth’s directions, I realized the work had been well worth it. We washed down the meal with some horchata (another funny word, eh?) José brought out the guitar and Janneth a set of bongo drums. We sang a few songs a laughed quite a bit. The evening ended up being much more than a cooking class. And that, I suppose, is the power of the pupusa. Make the curtido as early as several days before the pupusas, but no fewer than 6 hours before the feast. In a plastic container, combine finely chopped cabbage, julienne carrot, slit jalapeño and red chilly, cumin seeds, oregano, salt, water, and vinegar. Cover and set aside. Make the tomato sauce. In a blender, puree tomatoes, jalapeño, bell pepper, garlic, oregano, salt, and pepper. Drizzle oil while blending. Set aside in the refrigerator. Make the pork filling. In a pot filled with plenty of water, boil the pork meat, whole garlic cloves, oregano, bay leaves, cloves, salt, and peppercorns for two hours. Cool down and drain. The meat should be tender and fall apart easily. Heat vegetable oil in a pan and sear the pork meat. In a blender, puree tomatoes, onion, bell pepper, and salt. Set aside in a bowl. In a blender, puree the pork meat by blending a few pieces first and adding the rest slowly. The meat should turn into a paste. Mix the meat paste and pureed vegetables together in a bowl with your hands. Taste salt level. The result should be a pink looking paste. Set aside in the refrigerator. You can freeze the unused filling for a few weeks. Make the dough. In a large bowl combine the Maseca, salt, and lukewarm water. Knead until forming a smooth dough with no lumps. Set aside. Put mozzarella cheese in a bowl and warm up in the microwave for about one minute. You want the cheese to soften but not melt. Knead the cheese into a paste. Heat a flat griddle on the stove. Assemble the pupusas. You will need some vegetable oil to coat your hands. Take about ½ cup of dough and roll it into a ball with your hands. You should end up with something the size of a golf ball. Make a dimple in it with the tip of your index and middle fingers or with your thumbs. Fill the dimple with a generous amount of filling and roll over the dough around the edges to make into a ball again. Make sure the dough covers the filling completely. Flatten the ball into a disk by tapping it between the palms of your hands. If your hands aren’t oily enough, the dough will start to stick. Check out this video (minute 3) to see how this señora does it. Cook on a hot griddle for a few minutes on each side. 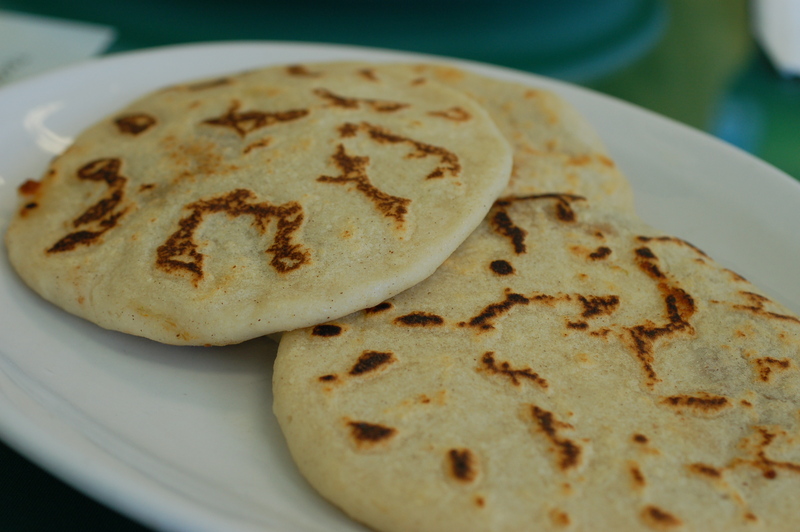 A cooked pupusa has brown spots all over and swells up a little – especially if you filled it up with cheese only. Wrap cooked pupusas in aluminum foil to retain heat. Serve with a little curtido on top and tomato sauce. 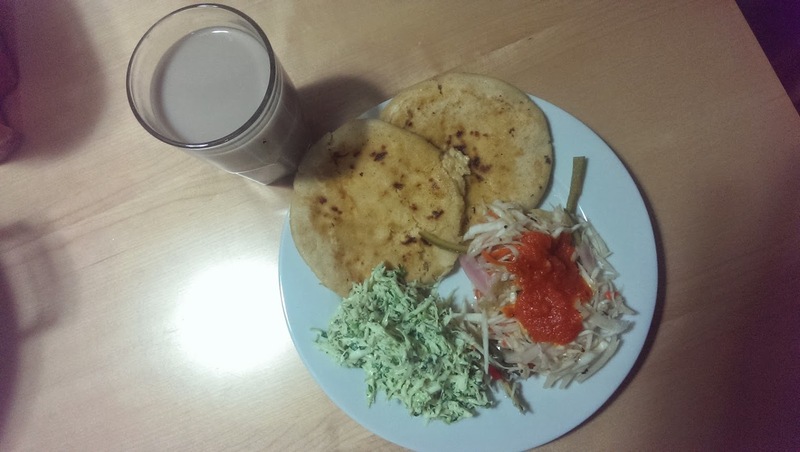 You can make cheese-only pupusas, cheese and loroco (a small flower bud common in Central American cooking) pork, pork and cheese, refried beans, etc. Nice work – I’m slightly addicted to the pupusas at Habanero’s on Brighton Ave.
Sean, do you know who owns Habanero’s? I’d love to feature them. I like that place! No idea – I get the impression that it’s a family spot though. 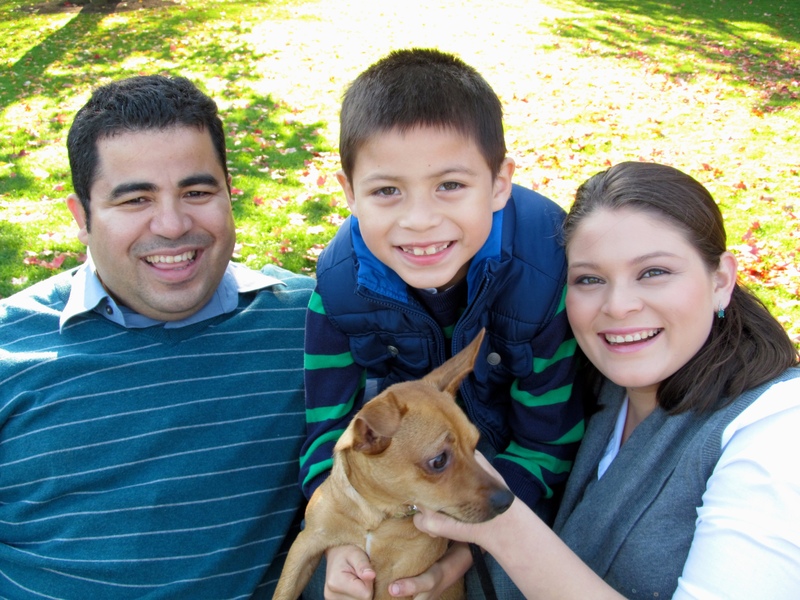 Jose and I were chatting in my office about Maine, New Hampshire and life and your blog came up in conversation! Really lovely and I look forward to trying my hand at these Pupusas!